THIS weekend coming we have the start of Féile with the Dublin Camogie Féile. We have two teams entered, one being hosted in Rush Maurs GAA, and one in Sandyford, Naomh Olaf. Full details on Dublin Camogie website. Great support for the Senior Camogie team Table Quiz last Friday thanks to all those who supported the event, very much appreciated. The have their league opener in the club on Tuesday. Minor A LF play Wednesday in the club. Lots of match reports below. 7 adult fixtures schedule for home games this weekend so further details to come on those. Hard luck to Chris Crummey on losing out in the league semi-final with Dublin Snr hurlers, commiserations also to the Dublin Minor A camogie team and our own Ellen Dunphy and Aoife Byrne who were part of the squad who lost out to a strong Galway outfit. A much better result for the Dublin 16A Camogie team who had a comprehensive win vs Offaly with 5 Lucan girls in the squad Lilly Rooney, Lauren Dawson, Phoebe Shannon, Mille Reid and Sinead Daly. Also well done to Darren Gavin who finished the league with Dublin Snr footballers beating Cavan. Lotto There was no winner of the lotto on the 21st March, Numbers were 4, 10, 13 and 21 . Next weeks’ jackpot €3,000, the draw will be managed by Josephine Donohue and is sponsored by Coláiste Laichtín, Inis Oírr. Lucky Dips Winners: Anna Nolan, Brendan Gallagher, Diarmuid Kennedy, Peter Rooney and Padraig McGarrigle. Play Online here, Or Tickets can be purchased at the Club, or in Kenny’s Vesey Arms. 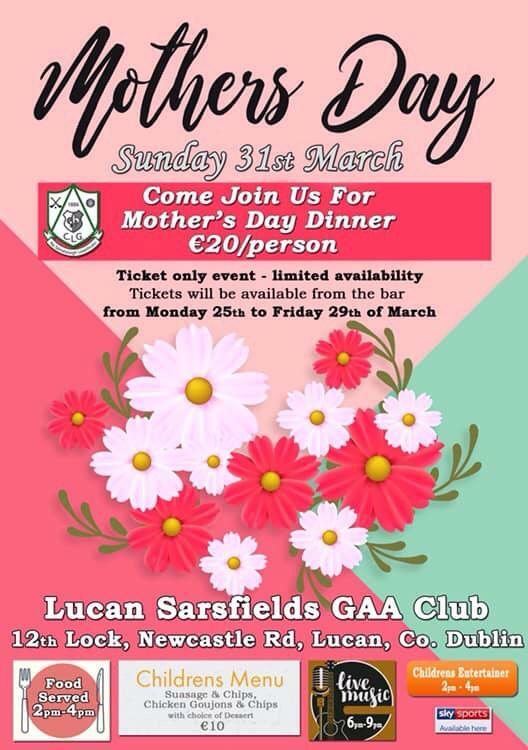 Mother’s Day this weekend and we have a great day planned in the club, 2 Course Dinner for only €20 p/p, kids menu and a kids entertainer. All sorted, tickets can be purchased at the bar. We have a great social initiative within the club and as with everything it’s very open to new members. The mission of the social initiative is to make clubs more age-friendly by increasing participation of the more established members, particularly older males, in events. They run monthly events for more information contact Seaghan O Lanagain 086 266 4947. 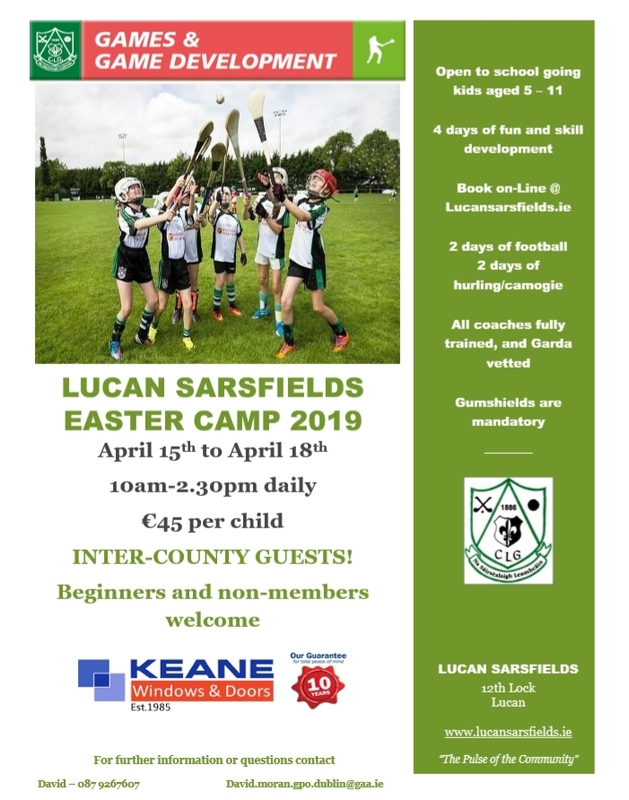 Lucan Sarsfields Disco 4th 5th and 6th Class Disco Friday 19th April; 7.30 pm – 9.30 pm (Supervised). This will be a ticketed event and tickets will be on sale in the bar for from Monday 25th of March limited availability €5. Club Shop is open Saturdays 10.30am to 1pm. On an afternoon perfect for football - the light clouds just making sure that the early spring, low angle sun was not too strong in the players eyes; the breeze too light to make a difference, unusual for the 12th lock, and after last minute adjustment to the goals by the Sarsfields handymen, not forgetting a new lucky top for Lucan mentor Phil Murphy, the scene was set. Referee Jason Corcoran got things started and Crokes immediately applied the pressure while the Lucan side, depleted by a few players for various reasons, took some time to adjust to the unfamiliar partnerships on the pitch. A sea of green at the back prevented Lucan ‘keeper, Emma McGivney from seeing the first ball fly past her into the net and could do nothing about the second. After the first quarter, Kilmacud were leading by 2 goals to no score, the girls in green started to come to terms with the opposition. Laura Lakes and Lauren Finnan marshalled the backs into shape, and Aoife Seery in midfield worked tireless helping out in defense and attacking on both sides of the park as well as taking scores when they were on. Maria Furmaniak opened her account as did Caoimhe Enright and Kerrie Jones and the Lucan Minors went to halftime with just a point separating them from their Kilmacud counterparts. HT: Lucan Sarsfields 2-4, 3-2 Kilmacud Crokes. Lucan continued where they left off after the interval, and pressed hard to level it and then to pull ahead, creating a five point lead after a goal from Kerrie Jones and points from Aoife Seery and Ellen Lyons. Kilmacud were not out of it yet though, and despite some great saves from McGivney and goal-line clearances, with around ten minutes to go Crokes scored another goal to bring it back to the most dangerous of leads for Lucan. For a nervous few minutes for the home supporters and mentors, Kilmacud attacked looking for the decisive goal, but great defending by the Lucan girls kept out the girls in purple. This was to be Kilmacud’s last hurrah, as the ball went to the other end of the pitch and Sarsfields tagged on four more scores before the final whistle, having held Crokes to just 1-2 for the half. Full Time: Lucan Sarsfields 3-13(22), 4-4(16) Kilmacud Crokes, in a very entertaining encounter. Kilmacud Crokes: A, Kennedy, L. Kennedy, G. White, E. Ní Lideadha, J. Williams, S. Galvin, R. O’Connor, K. Murphy, K. Gallagher, K. O’Connor, K. Broderick, C. Murray, S. Lynch, A. Murphy, A. Murray, S. Lehane, N. Territt, R. Quigley, R. Mulholland, R. Kirwan, S. Fagan. 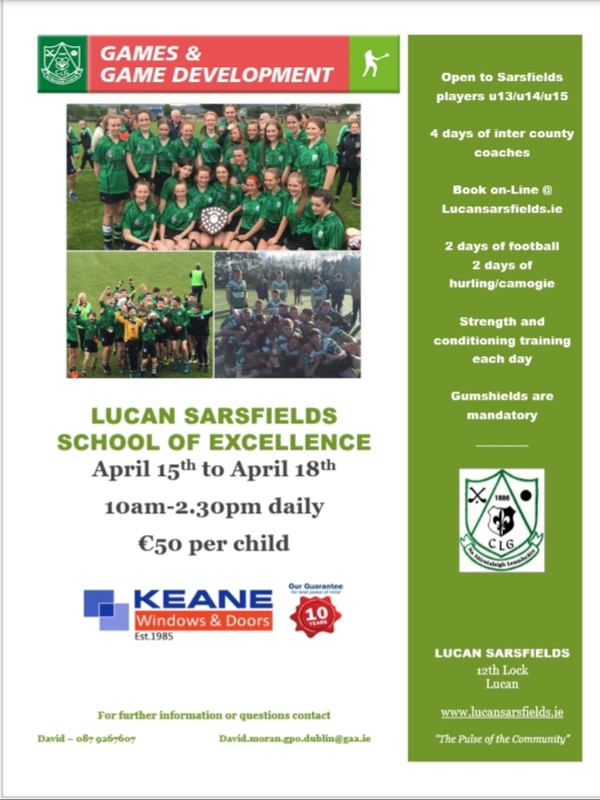 U12 Group A (3 Teams), Lucan Sarsfields v Skerries Harps, Lucan, 1pm. Lucan Sarsfields U16A’s took the trip around the M50 to St Annes Park, on what looked like, from inside the car, a perfect afternoon for football. Once on the pitch the strong crosswind coming from the north dropped the temperature down to the low single digits. Gary Carty, the referee for the game, threw the ball up just after 5pm and both teams tested each other out before the home team got two points on the board from play, one from Amy O’Boyle and the other the result of a great save by Lucans Emma McGivney, who forced the ball over the crossbar. The girls in green missed two scores on the left and right before a quickly taken free by Aoife Seery allowed Sadhbh Murray get Sarsfields on the scoreboard. Five minutes before the end of the half, a goalmouth scramble allowed Seery to get on the scoreboard herself. Isabelle Barr responded for the northsiders with a goal of their own a minute later and Ellen Lyons levelled things up with a free another minute after that. Before the half was out Ciara O'Connor and Barr had added points each for the hosts, and Lucan had failed to convert a free at the other end. Half Time Clontarf 1-4, 1-2 Lucan Sarsfields. Clontarf continued to press after the interval and another superb save by McGivney forced a 45 which the red team failed to convert. Strong work from Lucans defence, especially from the impressive Dublin U16 Camogie Captain, Lauren Dawson, fresh from todays win over Offaly, prevented Clontarf from gaining any advantage and when Mia Dunne scored to put the Girls in Green up a point, things were looking good for Lucan. With 15 minutes to go, Clontarf levelled again with a point from play, and Sarsfields missed right and left, then Clontarf struck again for a goal, before Lucan sub Ella Lacey took a fine point from play to bring it back to two between them. Clontarf got another point and in the last five minutes it was all Lucan, but hitting the crossbar, upright and Clontarf keeper, Caoimhe Mulligan, doesn’t count as scoring, and Sarsfields went back to west Dublin rueing their missed chances in a very evenly matched contest, where Clontarf are feeling really lucky to have not lost. FT score: Lucan Sarsfields 2-6 : 3-2 Naomh Olaf. The girls played a fantastic game, never gave up and rescued victory from the jaws of last-minute defeat with just seconds to spare. Lucan Sarsfields U8 girls football kicked off their 2019 season away to Ballinteer St.John's. 35 players made up 4 teams and played 3 matches each. The girls played very well and were a credit to Lucan Sarsfields. The Under 9's played their first match of the season today on a lovely sunny morning against St. Judes. All the teams played well with some great football on show. The girls are looking forward to their next outing. Lucan fielded 3 teams, in total 44 girls playing today, this is the highest turnout of players for the 2008. Ballyboden arrived with 32 players so Lucan passed some players accross to balance the numbers and reduce the number of Subs.The girls played with great style and team spirit. They tackled hard, fought for every ball and scored a number of brilliant goals and points. Most of the action this weekend was confined to the CCC2 teams. All three U-13 teams were in league action on Saturday. The fifth grading match for the U13A squad was against unbeaten Templeogue Synge St. on a very tight pitch in Bushy Park. The opening exchanges were even until a Lucan goal gave the Lucan lads the advantage which they held to half time where they led by 1-6 to 0-5. Templeogue started the second half strongly and by the midpoint mark had drawn level. However the game was decided by three quick goals from Lucan top scorer Adam Rock which gave Lucan the lead. Despite a late rally by Templeogue which yielded a goal, the Luacn defence held firm and they ran out six point winners and helps move the team up the league table. Squad:Sean Treanor, Chris Hylands, Callum Morris,, Robert O’Connell, Sean Flynn, Aaron Malone, Massimo Pappalardo, Gareth McDonnell, Reece Kelly, Callum Keane, Liam Fitzgerald, Gavin Collins, Adam Rock, Daire Collis, Charlie McHugh, Robert Keher. Perfect conditions on a Spring afternoon saw a 9 goal game in a very close encounter in Arthur Griffith Park. Castleknock ran out eventual winners by 1.03, despite the six point margin the game was a much closer than the scoreboard suggests. Lucan 3 points down at the break were only one point ahead with the clock ticking away. However, despite a battling performance they were eventually undone with a late 1.02 from the visitors. Overall Lucan can be satisfied with their work rate and attitude and look forward to another home game in 2 weeks time with plenty to work on. Squad:Conor Dolan, Shane Dolan, Alex Keegan, James Scott, Luke Gibbs, Ryan Feighery, Cian Waterhouse, Mark Deignan, Rory Eagan, Dylan Carr, Michael Lynch, Callum Wynne, Adam Salmon, Ben O Keeffe,Oisin Sharkey. A 3.00 kick off on a sunny afternoon in Tallaght on a pitch that was a little over grown greeted Lucan. For the second week running Lucan got off to a slow start with the opposition scoring a 4-5 in the first half and Lucan 1-1 Some of the basic skills were not working for the lads and were struggling to hold onto the ball. Lucan battled hard in the 2nd half, doubling up on tackles , playing some intelligent football scoring 4-3 to 1-2. Unfortunately, Lucan had 7 wides and conceded a penalty in the second half and lost out narrowly. Squad: M Brennan, C Lawlor, S Wright, D Harrington, E Walsh, D Thomas, J O’Reilly, C Murphy, S Geoghegan, F Haran, J Browne, S Tormey, S Walsh, C Hartigan. Scorers: S Walsh, J Browne, F Haran, C Hartigan, K Murphy. 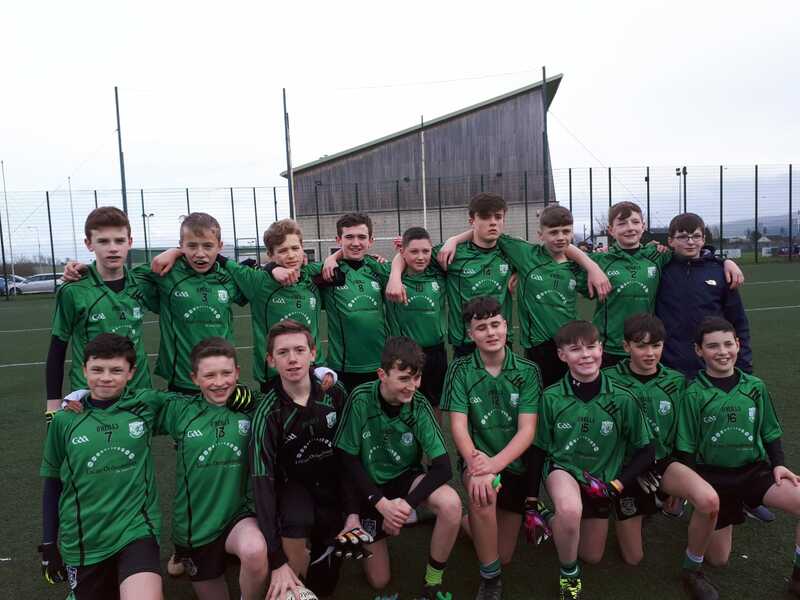 In the U-14 Football Division 1 league, Lucan were defeated by Templeogue Synge Street on a score line of 10-08 to 2-04. In the U-14 Division 5 league game, Lucan lost out to Naomh OP-ER on a score line of 8-07 to 3-07. A reader could infer the main reasons Lucan came out on top in this local derby from a scan of the stats. He or she might note that for the second week in a row the defensive unit prevented the opposition from scoring a goal. He’d notice the difference in number of frees conceded and perhaps deduce the discipline of the Lucan players when tackling along with their ability to get out in front of their opponents. He might notice the spread of scores and that all six forwards scored from play. The sharp eyed would notice that all frees taken by half or full forwards were converted. The stats won’t tell what a highly entertaining spectacle this was however. Both sides went at one another from the start in an end to end, fast moving and for the most part free-flowing match. Round Towers showed huge energy and a lot of character in chasing the game right to the end. Lucan players showed themselves adept at the modern sills of tackling and harrying but the icing on the cake was some wonderful high fielding by the full back and mid field lines in particular. Squad: Sean Kearney, Cian Nohilly, Cian O’Driscoll, Ryan Donnelly Ronan Munnelly, Kevin Keane, James Kearney, Oran Fitton, Jasper Nolan, Conor Smullen, Alex Keegan, Callum Norman, Daniel Mahon, Daniel Byrne, Cian Maher. Both of the U-15 teams were in league action on Sunday. The games are coming thick and fast for our footballers as the lads played their last league game before the Championship. Playing against a very strong breeze in the first half, it took Lucan till the end of the half to start playing. Closing out the first half 3 down, Lucan pushed up on a couple of kick outs and finished the half stronger scorning 1-02 to lead by 2 at half time. Focusing on not leaving shots short in the second half, Lucan hit the post 4 times but still put over six points to take a commanding lead by the middle of the half. Barrog came back with a number of points to draw Lucan back into a scrap but a great steal and pass set up Lucan for its final goal and despite leaking a goal in injury time, Lucan saw out the victory by 6 in the end. A prime example of a complete squad fighting for places on the team. This performance had been coming for a while. Lucan held Naomh Barrog scoreless in the first half, Lucan played well for the whole of the second half with supper performances and 100% commitment from all involved. Squad on the day: James Ryan, Cian Tracey, Matthew Ryan, Sean Carolan, Liam Farrell, Jack Kelly, Roghan Withero, Conor O’Neill (2-01), Matthew Byrne (2-03), Sam Donohoe (0-01), Niall Higgins (1-01), Jack Langan (1-00), James Moloney (1-00), Andy Glynn (2-01), Andrew Kennedy (1-03), Ronan MacCraith, Dara Moran, Fionn Buckley, Ross Campion (1-05) and Tommy Mulhall (injured). The U-16 footballers were also in league action on Saturday. Lucan began strongly and built an early lead, however Olafs finished the first half with a few scores to be two points behind at half time. Lucan started slowly in the second half and Olafs scored 1-3 without reply to take the lead for the first time in the match. Lucan were two points behind as the game entered into injury time, however literally with the last kick of the game Lucan scored a goal to run out one-point winners. Overall, a game Lucan were fortunate to win but some great fighting spirit to keep going until the final whistle. Squad – Cathal Doody, Neil O’Leary, Aidan Sheary, Cillian Morrissey, Stephen Ramsay, Rian Carey, James Finn, Jamie Lavin, Sean Quigley, Jack O’Donnell, Sam Noctor, Tony Mulqueen, Jack Lawlor, Hugh Cuffe, Matthew Coogan, Louis Butler, Brendan Kavanagh, Adam Whyte, Samuel Keogh, Ryan Lynch, James Finn, Shane Coffey, Rheece Lamphiere. Well done to all the teams competing at the weekend. Mixed fortunes for adult hurlers in league this weekend with defeat for Seniors, a good win for Junior As, while the Junior Bs drew with Realt Dearg 2-14 to 3-11. AHL 1: Ballyboden SE 2-15 Lucan Sarsfields 0-10. Lucan's difficult start to the Division 1 league campaign continued with this loss away to an inform Ballyboden team. Boden had the benefit of a strong wind in the first half and were quickly out of the blocks building up a 5 point lead before Lucan registered their opening score from Donal Flannery. In fact that was to be Lucan's only score of the half as the hosts lead by 10, 0-11 to 0-1 at the break. A penalty mid-way through the half had given Lucan a chance to get a foothold in the game but Seanie McClellands low drive went narrowly wide. Lucan turned around with the wind in the second half and were much more competitive. The gap was reduced to 6 when Boden got a penalty of their own which they converted. A second Boden goal with 10 minutes remaining put the issue beyond doubt. Lucan plugged away and good some good scores in the second half and overall were probably more competitive than the scoreline suggests. The Lucan full back line was solid throughout with John Bellew to the fore. McClelland gave a good display on his return in the half back line and upfront, Paul Crummey was most effective in a forward line that struggled to make inroads on the tight home defence. Lucan Team/Scorers: D O'Neill, P Rigney, J Bellew, P Claffey, P Kelly, M McCaffrey, S McClelland (0-1f), J McCaffrey, R Smith(0-1), R Ward, K Fitzgerald, C McHugh, P Crummey (0-1), A McNulty (0-1), D Flannery (0-5, 0-4f). Subs introduced: B Coffey (0-1), T Somers, E O'Conghaile. AHL 5: Oliver Plunketts 1-8 Lucan Sarsfields We 2-15. Lucan played with the wind in the first half and led at HT 1-10 to 0-2. While Plunketts were more competitive on the resumption they never looked like bridging the gap. The arrival of some of the subs from the Senior game helped Lucan shore things up in the second half. Lucan Team: Kevin Roche, Alan Flanagan, Tadhg Clandillon, Tiernan Swords, Podge O'Connor, Joey Byrne, Eoin O’Connor, Ian Crowley, Eddie Connolly, David Kavanagh, Rob Lambert, Oisin O'Brien, Cillian Hogan, Keith Brennan, Eoin Kenny. Subs Introduced: Tommy Somers, Rob Twomey, Anto Lee, Brendan McGarry.